Ries' Pieces: Need a boost this holiday season? Need a boost this holiday season? But my cynicism of Christmas has softened with the arrival of my children. Seeing their little eyes light up with the wonder of Santa and the excitement of seeing far away relatives has allowed me to view the holidays with the purity that only young children experience. Children don’t feel the stresses of the holidays with all the shopping, debt, bloat and overwhelming chores, they simply enjoy the goodness of it all. And the one thing that is most important about any holiday is that it brings people together. Families, friends and co-workers make the time to get together and to celebrate. Getting together usually involves eating. And eating usually involves sitting. And sitting usually involves, if you are too old for a highchair and too little to reach the table, a booster seat. Children between the ages of 2 and 5 are a difficult breed. They are stuck in the mushy middle between being a baby and being a kid. They want to do everything themselves. They repeatedly say no, even if they mean yes. They constantly imitate parents and older siblings. They simply long to be just like everybody else. And while they might refuse to give up on their diapers, binkies or bottles they desperately want cellphones, car keys, and chairs just like you and me. Most successful entrepreneurs are pissed off people that get motivated. They become pissed when they recognize the inherent flaw of a conventional solution and are motivated enough to do something about it. A combination that has brought many great brands to the masses. A pissed off entrepreneur had brought to market a brand that I would like to spotlight today. The story of Amir Levin and Kaboost shows how a new brand benefited from doing the opposite, having the right name and being first in a new category. Amir Levin is only 33 years old and doesn’t even have any kids of his own, but he could spot an opportunity when he saw one. While at a family gathering, Amir was frustrated by seeing his little cousins refusing to sit in booster chairs. They didn’t want to be different and would prefer to suffer by sitting on their knees than be in a baby chair. Instead of thinking, tough luck kids, he did something about it and Kaboost was born. Booster seats all follow a simple formula, design something to put on the chair to boost the child. When I was little they used phone books, but since then thousands of booster chair ideas have been brought to market. But no one ever thought about turning the whole idea on its head. Until Amir. Doing the opposite it a powerful strategy for many reasons. It creates a new category, differentiates you from competition and gives you PR potential. When you do the opposite it is instantly newsworthy. So what did Amir do? Instead of just boosting the child like every other chair, Amir boosted the chair. Brilliant! Now kids can really sit just like everybody else. And they don’t feel like they are in the baby seat anymore. Many a good idea has died right there. A better idea does not ensure success. Without a proper branding strategy good ideas wither, die or are stolen. Bad names, horrible packaging, lousy publicity, dysfunctional distribution can all bring a new brand down. And new brands are much more vulnerable to branding mistakes than established brands. So entrepreneurs have to pay special attention to adhering to the laws of branding. 1. The strategy: Do the opposite. Kaboost is not a better booster seat. Kaboost is the opposite of a conventional booster seat. Conventional boosters only boost the child. Kaboost boosts the chair and the child. The benefit is that the child can sit at the table just like everybody else. A big deal for little ones. The name is where many new brands make their biggest branding mistake. Giving your brand a generic, descriptive name might help explain who you are in the short term but it lays a weak foundation in the mind for the long term. Generic names leave you much more vulnerable to established companies stealing your idea and preempting your position in the mind with their might. For an entrepreneur with limited funds the most ideal brand name is one that is suggestive of the category. This way you get to have some of your cake and eat it too. You hint at what you are but have a unique brand name. Kaboost is a name that does just that. A generic name could have killed it. And a far out name would have met with more resistance and been more difficult to establish in the mind. 3. The verbalization of the message: Your child can sit like you. New brands don’t take off without word of mouth. And word of mouth is depended upon your message being easily verbalized, remembered and passed along. Again many new brands fall down on this point. They might have a great idea and the right brand name but they cannot put into words why they are so great. Or they give too many reasons for why they are so great, also a pitfall. To succeed a brand needs one simple idea verbalized in a memorable way. Dyson, the first vacuum cleaner that doesn’t lose suction, is a brilliant verbalization and created a powerful new brand in the mind. TiVo has been tripped up by not having a good verbalization of its brand. TiVo has never clearly verbalized its position. And while they have avid fans (myself included,) they have not made the huge inroads in market share many expected. I believe the lack of a verbalization is one reason why. TiVo also made a huge mistake running too much advertising too soon. Of course, blowing investment capital upfront on advertising was the downfall of many dot.com brand busts as well. 4. The package as a marketing tool. Don’t overlook the ability of the package to build your brand in the mind. The package should be treated with great importance in the brand building process. The package is the front line of your marketing campaign, it is your last chance to seal the deal. PR gets them to notice your brand and the box gets them to buy your brand. That said the box design should be simple and focused. The name and position should be prominently displayed. Dyson was one of the first brands to really use the box as a marketing tool. Typically vacuums came in generic brown boxes. Dyson used every side to sell the story of the brand. The Kaboost box is fantastic, you can see that plainly. Kaboost is a newsworthy brand. In order to be newsworthy you have to be different. Being the first chair booster is much more effective for getting PR than introducing a better booster. And PR is the way you build brands. There are also several different PR angles to the Kaboost story. Amir has been on The Big Idea with Donny Deutsch to discuss how young entrepreneurs turn ideas into companies. 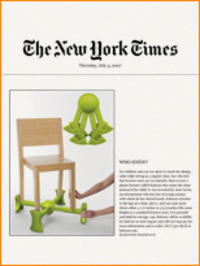 Kaboost has been featured in the New York Times as a new and noteworthy product. 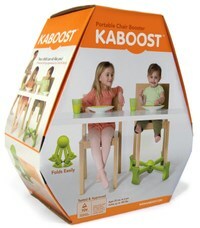 One news outlet called booster seats so passé, now that Kaboost has arrived. Thanks to Kaboost, my little one will be sitting at our table this holiday season just like me, his Dad and his big brother. Kaboost has granted my terrible two at least one minor victory in his war of independence. And any day there is a battle Mom can avoid is a good day for all of us on the home front. SIMPLICITY IS THE HEIGHT OF SOPHISTICATION. Kaboost has done every thing from the product conceptualization stage to marketing in a simple and direct way. 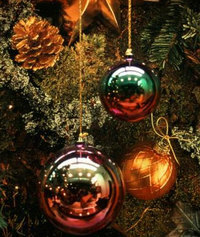 So Happy Christmas to you, family and your blog readers. Hi Laura, Happy Holidays, Holy Days and Merry Christmas! I like this story because it proves once again that a brand is nothing more than something that someone started that caught on...and that this person is the person who has a brand story, while all of the heavily price-driven commodity brands found in chain grocery and drug stores do not. I mean, after reading your post on KaBoost, I can as easily recite this brand story as a nursury rhyme. I can't so easily recount Tide or Crest's "brand story." Anyway, brand stories are snacks I'll be munching on over the holidays. They're low fat and calorie free food for thought. Back to an earlier post you closed on branding Atlanta with a new slogan. Should the bar be elevated to reinventing Atlanta's name? Having invented Slice, that brand has now gone the way of Sierra Mist (by the way, I have a cabin in the Eastern Sierra - there is rarely any mist - it's arid). Sci-fi offers Atlantis. How about a rebirth or re-imagining a la Tin Man? I wish you and your dad the best! I agree my 2.5 year old would love being able to sit with everyone else at the table, but then parents lose the ability to strap the child in securely (especially important with a messy meal). Perhaps a buckle could be a product improvement/upsell. What a great idea for a product and an excellent recap of the strengths of the product and the marketing. Thanks for sharing.